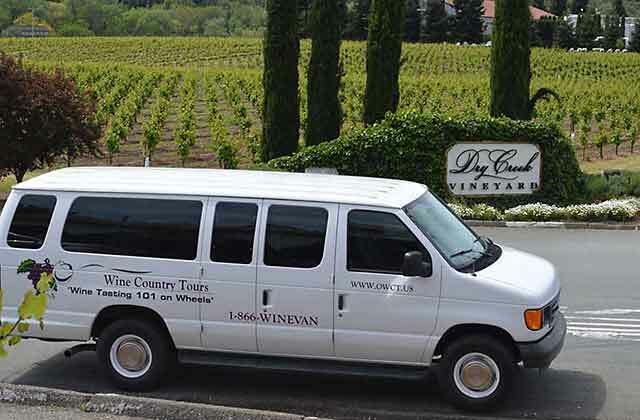 In short, we explain how to hire a limousine or van service to wine country. Hiring a limo to the wine country is a great option for those who don’t want to drive. Tell the limo driver where you want to go. To plan your trip consult our regional wine trails or use our handy Winery Finder/Trip Planner to select wineries. Use our wine country guide to plan and select a wine trail and route. Then, hire a limo and hand the driver your itinerary. Sit back and relax and enjoy. Read our tips and then check our limousine service page for listings of several limo companies. Enjoy wine without worries about having too much fun or losing your way. This varies depending on the limousine company. Charges are made by the hour, the day, the number of people. The cost does not usually include any tasting fees that wineries charge. Don’t forget about figuring the tip into your cost (see below). Several wineries, especially in the Napa Valley, will not receive parties in limousines or mini buses, unless an appointment is arranged ahead of time. Smaller wineries often do not have the space to accomadate tour groups. Many limousine services will arrange a picnic lunch for you. They will pick up the lunch and have it ready for you at one of the wineries. You can request which winery for the lunch. Always call the winery and check to make sure they can reserve tables for your party. A 15% to 20% tip is usually added to the cost of the trip. Check with the company to make sure how the tipping is handled. If you particularly like your driver, then an extra tip might be in order. Some of the wineries on our tours have narrow driveways or other situations that make them inaccessible to limousines. A few wineries have a no limousine policy. If you are serious about wine tasting, limit the alcohol you drink to only the wines you will be tasting at each winery. Limos sometimes provide champagne to drink along the route. Too much alcohol means no taste buds. A Guided Tour Operator – A guided tour operator is one that is trained and knowledgable about the wine country. They will have much information to tell you along the way. They usually have a van or limo. In contrast, when you hire a limo service, the driver may or may not know anything about wineries, winemaking, etc. A Scheduled Tour – This tour is usually on a bus that has a set itinery or schedule. The passengers have no say in where to go. A scheduled tour will have a trained tour guide on board.